The band Ghost Beach is running a controversial billboard campaign in New York's Times Square. With slogans such as "Piracy is Progress" and "Piracy is Robbery" they are encouraging other artists to speak their mind about copyright infringement. The band itself told TorrentFreak that it is ultimately against piracy, but that the problem can only be tackled when consumers have affordable and convenient alternatives. For now, they want the public to choose whether they want to pay for their latest album, or download it for free. Piracy is progress, piracy is freedom, piracy is harmless, piracy is inevitable, piracy is robbery, piracy is evil, piracy is selfish, or is it a fad? The statements above are displayed on one of the world’s most prominent billboards in Times Square, New York. 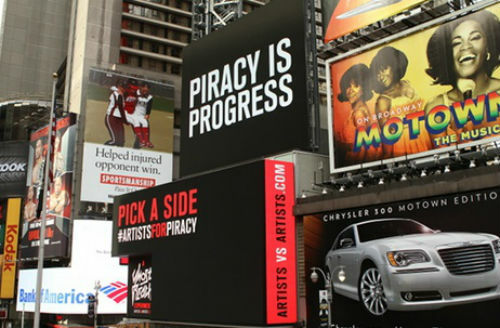 The billboard displays both positive and negative views on piracy and encourages the public to add their views via Twitter. Thus far the for-piracy side outnumbers the against-piracy side 20 to 1. The controversial campaign is being run by the Brooklyn band Ghost Beach and set to continue for two weeks. Normally such a campaign would cost tens of thousands of dollars, but the band received it for free as part of their licensing deal with American Eagle for their song “Miracle”. “Rather than just put up another advertisement, we decided to open a discussion up with our peers about how they felt about music distribution on the internet and the future of the industry,” the band frontman Josh Ocean tells TorrentFreak. The billboard directs people to the “Artists vs Artists” campaign site where visitors have the option to either download Ghost Beach’s album for free, or buy it in the iTunes Store. In addition people can share their views on piracy, with a Twitter hashtag keeping the “for” and “against” scores. While Ghost Beach allows fans to download their music for free, the band told TorrentFreak that they’re not encouraging piracy. “Although we do think that there have been many positive progressions in the world of music distribution and sharing platforms as a result of piracy, we are ultimately against piracy,” Ocean says. According to the band the music industry should keep in mind what consumers want. For them, giving away music makes nothing but sense as it introduces the band to new fans who may spend money in other ways. “By giving music listeners the choice to buy, stream or download free from the artist, everybody wins and music is shared in a way that is convenient for listeners and respects the artists intellectual property,” Ocean says. Giving people the option to download for free might not be a bad thing indeed, and piracy is all too often used as an excuse. Of course not all artists will agree with this. Perhaps the question shouldn’t be whether piracy is good or not, but how we can make piracy irrelevant. Whatever the outcome of this debate is, Ghost Beach will get plenty of PR, which may be the true intention of reviving the good old piracy debate on a Times Square billboard.